Racism, the belief that one race is inherently better than another (or all others), is a despicable though still surviving phenomenon in our society. Though discrimination based on race is illegal in the United Kingdom many private citizens still harbour racism in their thoughts, attitudes and actions. Today there is much that can be done to confront racism. Confronting an individual (when it is safe to do so), reporting discrimination and educating others are all steps that anyone can take to help confront racism. Many individuals will make discriminatory remarks or jokes about individuals of other races because they are ignorant. Unfortunately these individuals often feel free to share their views with little regard for the thoughts and feelings of others. If it is safe to do so, confront such individuals with a short, no-nonsense approach such as by saying (with disgust) "I can't believe you just said that" or "What a disgusting sentiment". Such a stark reminder that racism is intolerable may be enough to shock the individual into reconsidering his or her words, or to shock others into vocal support of your statement. Whether or not you convince anyone, however, it is often best to leave a conversation after making your point. Not only will this help keep you safe from verbal or physical retaliation but it will help you make the point that you want nothing more to do with that individual. If you see racial discrimination taking place, or if you are experiencing discrimination, let others know that you are aware of what is happening. This is often enough to stop discriminatory practices. If it is not then leaving the immediate area and reporting the discriminatory practice is usually the safest option. The Race Relations Act 1976 protects individuals from being discriminated against in employment on the grounds of colour, race, nationality, religious beliefs or ethnicity. This Act does not distinguish between whether racist practices were done on purpose or not, only that racial discrimination was the result whether by direct discrimination, indirect discrimination, harassment and/or victimisation. If it is believed that this Act has been breached then going to court is one way of reporting and hopefully ending racist practices. Reporting racism to local authorities is another method of calling attention to inappropriate practices, particularly if racism is experienced while receiving health or social care. Finally, reporting racism to organisations working for equal rights may also help to eradicate such behaviours. The Equality and Human Rights Commission, One Workplace, Rewind and the Race Equality Foundation all work for racial equality and fight against racism in the United Kingdom. Though it is not right, it is often left up to the individuals who recognise discrimination such as racism to educate others about why these practices are inappropriate. Often educating others about the meaning of race is the first step in this process since it allows others to see that people of all colours, races and ethnicities are equally able and have much to offer. If this is not enough to stop racism then educating others about the law and the consequences of discrimination - particularly if it pertains to their freedom or livelihood - may get them to stop their discriminatory thoughts or practices. If not, reporting discrimination and getting authorities involved will hopefully cause racist practices to cease even if it might not change the perpetrator's attitudes. Discrimination due to race is both inappropriate and illegal, but sadly it does still occur. 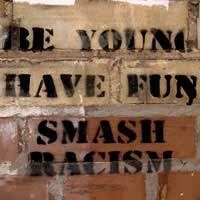 Confronting individuals about their thoughts and actions, reporting discrimination and educating others about ageism are all ways to confront racism when it does occur. Earlier this week I went to my local Waitrose to pick up some stuff I had ordered from John Lewis. At the customer service desk I was asked for my name, which I gave, and for my order number, which I couldn't find, but they didn't seem to think it was a problem - the assistant just told me to wait while someone fetched my order. The customer behind me was a smartly dressed young black woman, also picking up a John Lewis order. She was also asked for her name and order number, and then the assistant asked her for some ID. The store was busy, so while I was waiting for my stuff, I observed several other customers (all white) coming to the customer service desk to collect John Lewis orders. Not one of them was asked to produce any form of ID. Since the young black woman was also waiting, she probably noticed the fact that she had been treated differently from the other customers. I did try to report this to Waitrose using an online form but when I pressed 'submit' I just got one of those 'oops something went wrong' messages. I guess I should write to the manager of the branch where I observed the incident.